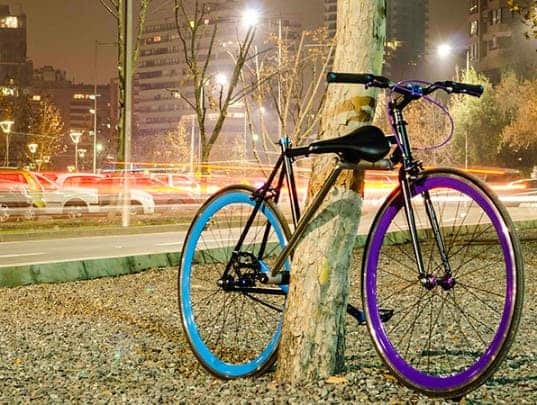 Depending on where you live, bike stealing can be a distant threat or a constant worry, but in most parts of the world, people would rather be safe than sorry, tying their bikes to trees or fences or whatever they could find. But that may very well change in the near future: three engineers from Chile have developed a bike which they claim is impossible to steal. The Yerka Project is a currently a prototype which runs around and shows the frame of the bike unlatching so that, along with the seat post, the bike frame itself can close around a stationary object. Basically, the frame of the bike itself becomes the lock. If you want to break the lock, you have to break the bike – so there’s no point in stealing it whatsoever. From what I can see from the video they published, it takes about 30 seconds to tie it up, so it’s not a drag either. The bad thing is, that if you live in a really bad area, your tires can still be stolen – but even so, replacing the tires are much cheaper than replacing the bike. Personally, I’d really like to test it out and see how it works, but we’ll have to wait a while before Yerka actually starts hitting the shelves. So, what do you think about this? Is it a much needed engineering tweak, a needless update, or not important at all?